Do not adjust your TV sets. And by TV sets we mean laptop/smartphone/other futuristic device screens. Bad//Dreems have gone full ’90s, delivering a nostalgia-gasm so potent that you’ll wish you had a VHS player to tape it and manufacture bootlegs to sell out of your car boot at their next concert. The Adelaide punks’ new clip for single ‘Feeling Remains’ is an epic spoof of ’90s music TV show par excellence, The ABC’s iconic Recovery, and even features the show’s old host Dylan Lewis (who may also potentially be a vampire because he hasn’t aged at all?!) making an hilariously awkward cameo. The tune itself comes hot on the heels of the band’s highly-flogged moshpit banger Mob Rule and forms the second single to be torn off their just-announced sophomore album, Gutful, which is due to drop on Friday, 21st April. 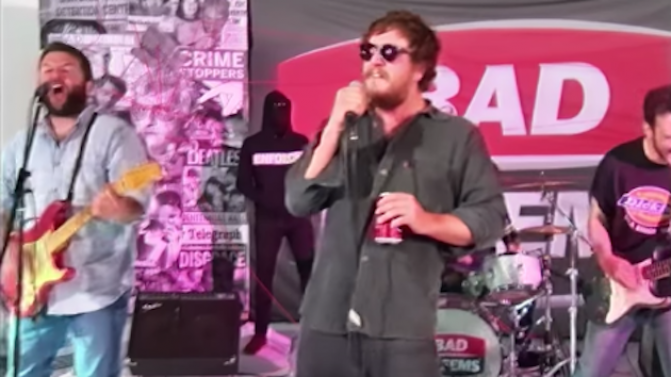 Catch the full clip below, and lucky fans in the lads’ home city of Adelaide can catch Bad//Dreems supporting Aussie legends Midnight Oil on tour later this year.